The Cedars-Sinai Women’s Cancer Program at the Samuel Oschin Comprehensive Cancer Institute and our Gilda Radner Hereditary Cancer Program participated in this study and the analysis of the results, and I am an author on the report, entitled Impact of Oophorectomy on Cancer Incidence and Mortality in Women with a BRCA1 or BRCA2 Mutation. The research is based on data from an international registry of almost 6,000 BRCA carriers, some with cancer and some without. Our goal was to estimate the benefit ofrisk-reducing salpingo-oophorectomy surgery (removing the ovaries and fallopian tubes) in patients who have a BRCA1 or BRCA2 mutation. Over an average follow-up period of 5.6 years, this preventive intervention was shown to be associated with an 80 percent reduction in the risk of ovarian, fallopian tube, and primary peritoneal cancers. More than 40 sites were involved in the study, including centers in the U.S., Canada, Austria, France, Italy, Norway, and Poland. This study gives us another important piece of the puzzle in our efforts to find better ways to prevent ovarian cancer. However, it cannot definitively provide the age at which an individual woman with a BRCA mutation should have her ovaries and/or fallopian tubes removed. Rather, it provides vital data that allows physicians to personalize recommendations based on BRCA1 versus BRCA2 mutations, along with other factors such as specifics of the woman’s family history of cancer, whether or not she has completed childbearing, her use of oral contraceptives, and other factors. Thankfully, advances in this field are accelerating, and recommendations based on new scientific knowledge of the origins of ovarian cancer are evolving. This study is one example of many research efforts that are currently underway at the Women’s Cancer Program. We are also focused on non-cancer health risks associated with BRCA mutations like heart disease and diabetes. 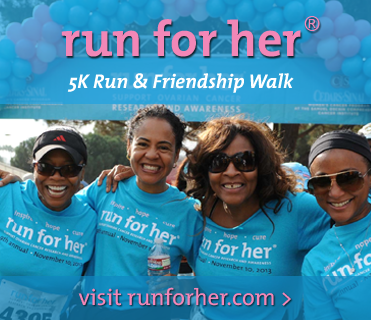 Our ability to participate in scientific investigations such as this is made possible by your support for Run for Her®. You are making a difference and helping us move ever closer to our goal of ending cancer as a threat to women.